AMC released today the official key art for the second half of The Walking Dead Season 6, which returns Sunday, February 14 at 9:00 p.m. ET/PT with the episode No Way Out. 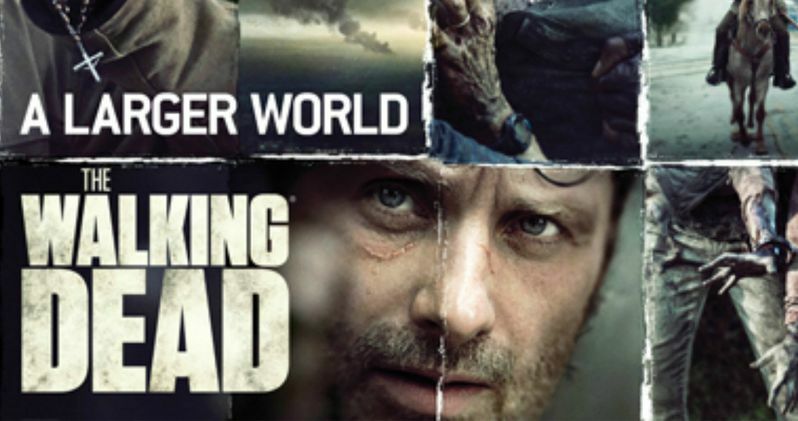 This banner features a collage of images that tease the larger world Rick Grimes (Andrew Lincoln) and his group will discover in these new episodes. Here's what The Walking Dead executive producer and showrunner Scott M. Gimple had to say in a statement about this poster. "This image gives a look at tiny pieces of a larger world our group is about to discover. In the new world, they'll find hope, possibility, tragedy and the terrifying cost of change." Unfortunately, this banner doesn't give us our first look at the long-awaited character Negan, who was teased at the very end of the fall finale, Start to Finish. Back in November, the series cast Jeffrey Dean Morgan as Negan, who will first appear as a guest star in the The Walking Dead Season 6 finale. He will then become a series regular in The Walking Dead Season 7. Many fans are wondering if the arrival of Negan will mark the end of one of the show's beloved characters, Glenn (Steven Yeun). Negan has remained the primary villain in the comics ever since he killed Glenn with his iconic weapon, a baseball bat named Lucille, which is wrapped in barbed wire. In the comic books, Negan is the leader of a violent group known as the Saviors, who use force to take over survivor communities. And they will invade Alexandria in the Season 6 finale. The character was originally introduced in the landmark 100th issue of the comic book. In that story, Negan comes face-to-face with Rick Grimes, who has heard of Negan. Rick wants to stop this leader and his deadly men from taking supplies in exchange for protection from Walkers. The character is way more deadly than The Governor, who was a major force in The Walking Dead Season 3. When we last saw Rick and his small group of Alexandria survivors, they had covered themselves in zombie guts and were trying to make a break from the overtaken community. But Jessie's son Sam was about to have a mental breakdown. How will Rick and his crew survive in these new episodes before coming face to face with Negan in the season finale? We'll find out in just a few short weeks, but for now, take a look at this banner below.